There will be another demonstration against the World Cup this evening in São Paulo, the biggest city in South America and host of the Opening match between Brazil and Croatia. 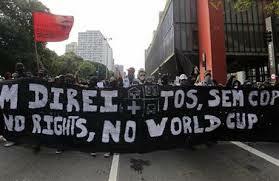 Organised by the Movimento dos Sem Terra (Landless Movement in a free translation), it claims better housing, free public transportation, improved health and education, demilitarization of the police and sovereignty of Brazilian workers during the hosting of the World Cup. That is the point . Hosting an internationally important event can be a huge wealth generating factor. It is a massive opportunity to get money invested in sectors which are normally relegated . But it can also backfired. It can bring out the mistakes, misjudgements, the mismanagement. The protests should concentrate in getting the infrastructure works done; airport improvements, new rail and transport implemented. And obviously in making sure the politicias understand that we are watching and our conclusions will reflect on our voting. That is the only action they understand. A survey done by Datafolha and published today has revealed that the support for these protests is waning, not increasing. During the Confederation Cup the demonstrations had 89% of support from the population. Today it is only 52%. That is also due partially to the inconvenience caused to the millions of people but also to the confrontation with the police which has caused even death of a cameraman.